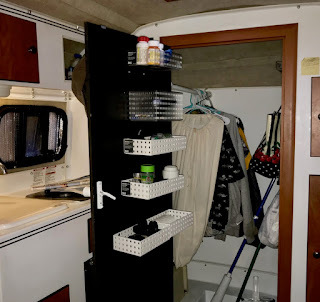 Living fulltime in a trailer the size of MsScampy, is improved sooooo much with convenient storage places. When Twayler arrived in September, 2016, we went over to The Container Store and picked up a bunch of their various size plastic containers. When we began fulltiming with Scampy, many of those containers came with us. A couple days ago, on a whim, we attached one of those containers to the inside of the door to Scampy's toilet/shower door. That container proved to be very handy! Close to our kitchen, we put a few condiments in it. Now, there are six containers on that door! Yesterday, we treated Cousin Jacky out for breakfast. This morning, we have a date with Evie for brunch. As you may know, Evie and I were married and got divorced in 1985. Now, Evie and I are good friends! We are heading south after having a lovely time at breakfast with Evie. Just south of San Onofre, is a view point with a wonderful sight of the Pacific Ocean. Spectacular lighting! We have made a Supper Camp in a quiet residential neighborhood close to the Town of Pacific Beach. Of course we will be watching the PBS NewsHour in order to learn about the latest goings on! Love those easy Trader Joe meals. I had one myself tonight. Bass with rice and veggies. Really good. Isn't really something how Trader Joe's prices their stuff so reasonably yet the quality is sooooo high?